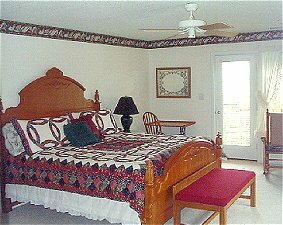 Our three spacious rooms are completely furnished with king-size beds, private baths with Jacuzzis, central air, ceiling fans, TV/VCR, phones and internet access. Two rooms have gas-log fireplaces, Each room is beautifully decorated with artwork and antiques, and has a relaxing view of the bay. Breakfast beckons with Judy's freshly baked muffins, egg casserole or quiche, cereal, fresh fruits, coffee, tea and juices. Reservations may be made by fax, phone, e-mail or mail with 50% deposit by credit card or personal check. Seasonal rates vary from $80-$150. 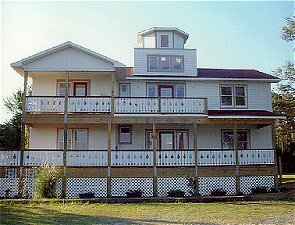 Our central location on North Carolina's Outer Banks gives easy access to all that this historic area has to offer. Bicycle the bike trail to the beach, or stop off at the Wright Brothers Memorial. Sights also include The Lost Colony, Jockey's Ridge sand dune, Elizabeth II and many more. Fishing, boating, no end to the sports enthusiasts activities. This and other Kill Devil Hill Bed and Breakfast Inns can be found here in The Register.